Popped in to try the Organic beers a couple of weeks ago.. In our group we tried all four on offer, but I hope we caught them on a bad Saturday evening because they were all as flat as pancakes. Organic pub, organic beer and organic people. Lots of young blokes with beards. Its what you would expect from an organic pub. Beer was fine but I didnt feel comfortable. 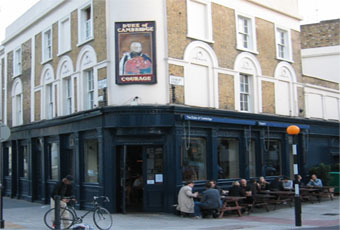 I went to eat in this pub in a party of 4 people last Saturday 3rd March 2012. The organic beers were excellent, and the organic meat was apparently fantastic. I had the fish and chips which was warm to cold on the plate. The waiter however was exceptionally rude in a polite kind of way: which spoilt the meal. We had three selections of cheese which was a rip off at �12! Why can restaurants not provide more than the three biscuits? If you can survive chilly Islington cool � I would recommend it: but it�s not cheap! I've been enjoying this place for years, and I have to admit as an ale lover it has been hit and miss for the vast majority of that time BUT for the last six months they really have sorted out their act. The porter (when on tap) is just knee weakeningly awesome as is the resident Eco Warrior. Finally someone has given these ales the attention they deserve. Hat's off to who ever that is! Cheers! Excellent pub, great food,chilled but informative service and WOW!!!! WHAT A WHISKY LIST!! !